1st Image- What I noticed once when I saw this image was how it was color coded to black and white. How the words were bolded in black. I think mostly to show and have others see these bolded words and take it with them. The phrase written on this poster is powerful. I heard this phrase being said mostly everywhere. Black people fighting for their rights against police brutality. It has been an issue for a very long time and different people around the globe has been protesting to stop police brutality. The hand prints that are on the poster demonstrates “hands up”. 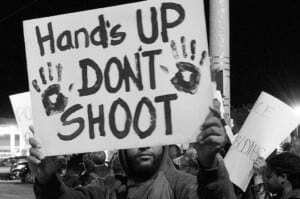 Trying to say even though one has its hands up, please don’t shoot. This photo is trying to say even they have their hands up, they still feel like they are being targeted and are going to shoot anyways. Which I feel is not right. All people including black people should feel safe around any police officer because it is their job to protect us, not shoot us. 2nd Image- This image speaks. With a young black male holding a poster that says, “Am I Next?” shows how much it is affecting the young and making them feel like they are being targeted so much by the police. 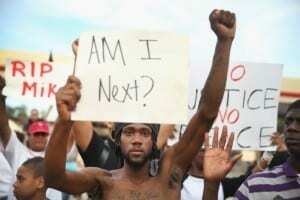 With all these commotions going on around the world, officers shooting young black males needs to be looked at. If there is no justice, then there is no peace. The person holding up the poster with his fist up takes it back to the days when “fist up” was a symbol for the blacks meaning black power. It sends out a powerful message. 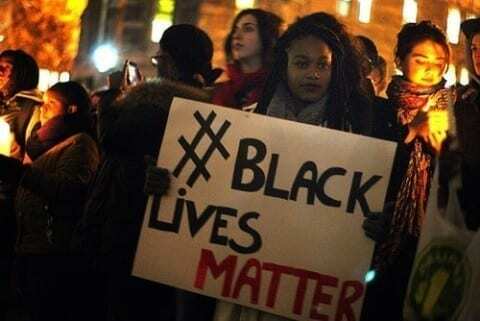 Black lives do matter and all this police brutality and discrimination against them needs to stop. We are all people and should be treated with respect. Hands Up, Don’t Shoot by Agnes is licensed under a Creative Commons Attribution-ShareAlike 4.0 International License. I am intrigued by your post because I think the police have been abusing their power in the U.S and are not punished for it.Also you good evidence of how Police have been abusing their power. One thing you said that stands out for me is: “This photo is trying to say even they have their hands up, they still feel like they are being targeted and are going to shoot anyways. Which I feel is not right. All people including black people should feel safe around any police officer because it is their job to protect us, not shoot us.” I think this is interesting because it shows how police are almost killing for fun since people are complying to the police and being killed anyways.